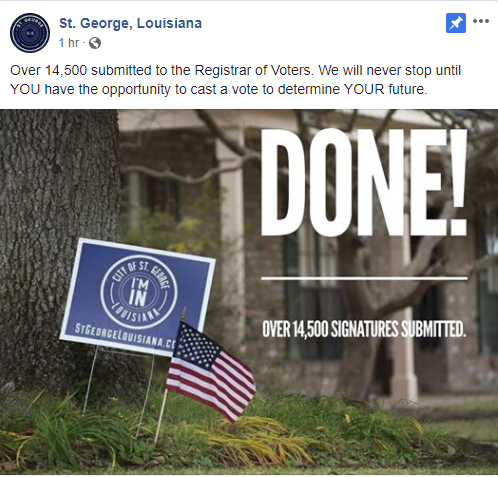 Apparently the signature count required to turn the St. George incorporation petition into a St. George incorporation election in the southern parts of East Baton Rouge Parish is right at 12,951 entries. The organizers have quite a bit more than that number based on the petition they turned in this afternoon. That would put St. George with about a 1,600-name buffer as the petition goes to the Registrar of Voters, with five days for the petition to be added to as the St. George organizers continue to seek signatures – and the opponents of the new city’s incorporation seek to pressure petition signers to withdraw their names. Frankly, it would be difficult to believe anybody who signed the St. George petition would withdraw based on the representations of the Better Together/OneBR gang. These are the people who slavishly defend a never-increasing parade of proposed tax increases to support and grow a city-parish budget of more than $900 million per year, and to hear them discuss the St. George incorporation is an exercise in comic inconsistency – St. George incorporating will bankrupt the city-parish government, while at the same time St. George won’t generate enough revenue to function as a city. One gets the impression that not even the Better Together/OneBR crowd really believes any of it. There’s an element of “professionalism” here, in that they’re really just saying what they’re being paid to say. 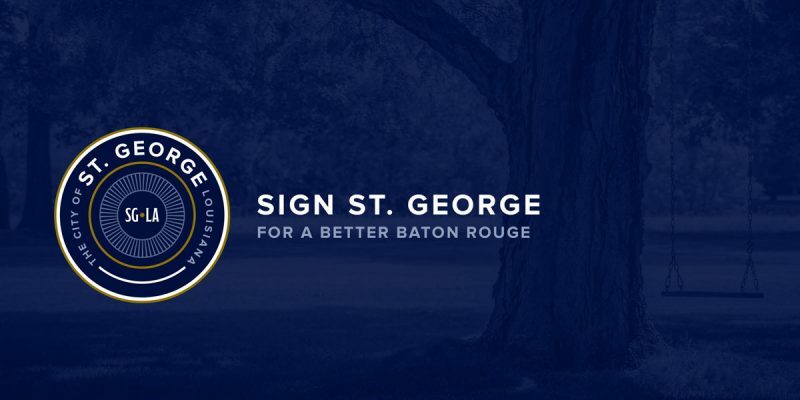 efforts to create a new city of St. George in southeast East Baton Rouge Parish — much to the dismay of proponents who thought recent changes in state law would prevent annexations from happening during their current petition campaign. Registrar of Voters Steve Raborn said he has concerns about the prospect of the city starting piecemeal annexations again even as his office tries to validate signatures on a pending petition to create a new city — especially because state law on the matter appears to favor those who want to block St. George’s incorporation. According to M.E. 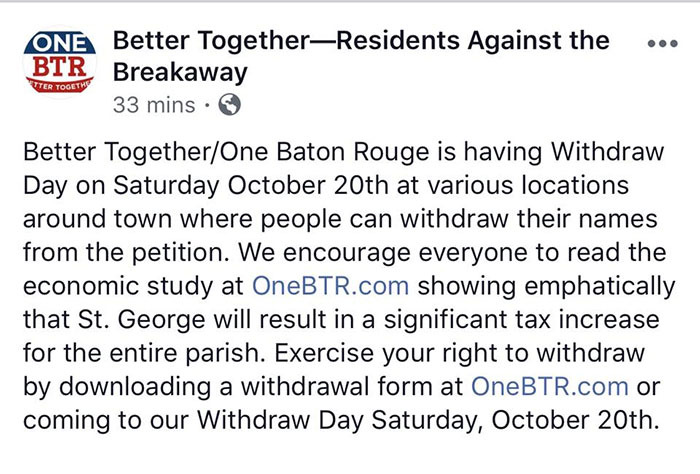 Cormier, leader of the Better Together/Residents Against the Breakaway group, there are at least two commercial businesses and a large subdivision within the proposed boundaries of the new city poised to submit annexation requests to the East Baton Rouge Metro Council for approval. But there’s debate over when that can occur. St. George proponents and state legislators who in 2016 crafted amendments to the state’s incorporation laws claim that’s not supposed to happen while an active petition drive is in play and signatures are awaiting verification. However, Cormier and the attorney who defended the city-parish against proposed city of St. George backers three years ago argue state lawmakers seem to have created a loophole in their attempt to block annexations from occurring during incorporation campaigns. They assert that requests from annexations could start pouring in the day after the allotted time organizers have to gather signatures. For the current St. George movement, that’s Nov. 28. “I don’t think the state Legislature realized they created a loophole,” Cormier said. “The law specifically states that during the 270 days given to circulate a petition for incorporation, no annexations within that proposed area can take place. That’s the kind of bad-faith, corrupt machination which will turn what could be an orderly transition with relatively minimal effect on the political landscape in East Baton Rouge Parish into all-out war, and we’d be completely shocked if it didn’t result both in action by the Attorney General’s office and in a federal lawsuit. 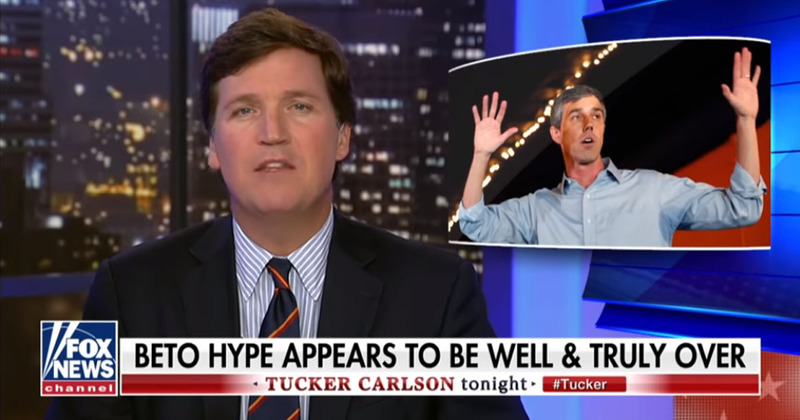 Let’s hope cooler heads prevail, because if they don’t and the opponents engage in that level of shenanigans, things will begin to get very ugly in East Baton Rouge.